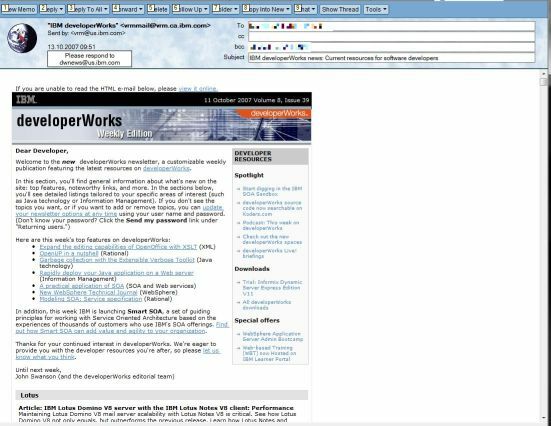 IBM developerWorks for Lotus (the website formerly known as notes.net) is one of the premier ressources for Notes-Developers. Amongst articles, blogs, several forums and RSS feeds, it also offers a weekly e-mail newsletter summarizng „what happend on the site” in the last week. There is NO context, that can’t be transported as plain text. All we gain through the use of html inside the mail are some graphics (loaded via the web like spam) and a fancy table-based layout like we are in the 90ties of the last millennium. THERE IS NO CONTENT, THAT COULD NOT BE MADE AVAILABLE VIA text/plain !! !